The partly-ruined basilica dominates the skyline. In Australia on this day, 25th April, we commemorate the centenary of the beginning of the campaign at the Dardanelles (modern day Turkey), which was the brainchild of Winston Churchill. This eight month campaign on the beaches and cliffs of Gallipoli was a dismal failure without any strategic gain and which resulted in the deaths of many thousands of Australian, British and New Zealand soldiers (in addition to some Canadian and Indian troops) and their Turkish adversaries. Since that day in 1915, Australia especially has commemorated this particular campaign of the First World War. 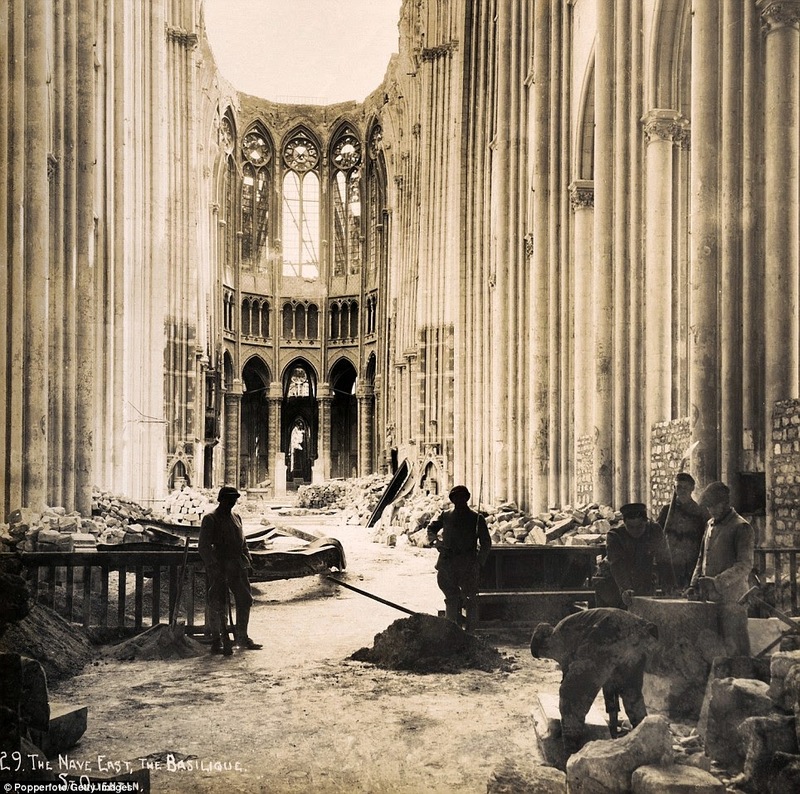 French soldiers and workmen amidst the ruined nave of the Basilica of Saint Quentin 1918. Juxtaposed with the incomprehensible scale of casualties throughout the Great War (1914-1918) is the destruction of towns in Belgium and France - the victim of heavy artillery shelling. We should not be surprised that when human life counted for so little, the sanctity of the House of God would not be respected either. 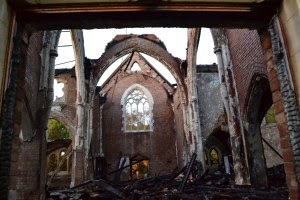 Quite a number of centuries old churches and cathedrals were reduced to rubble in this horrific, senseless conflict. 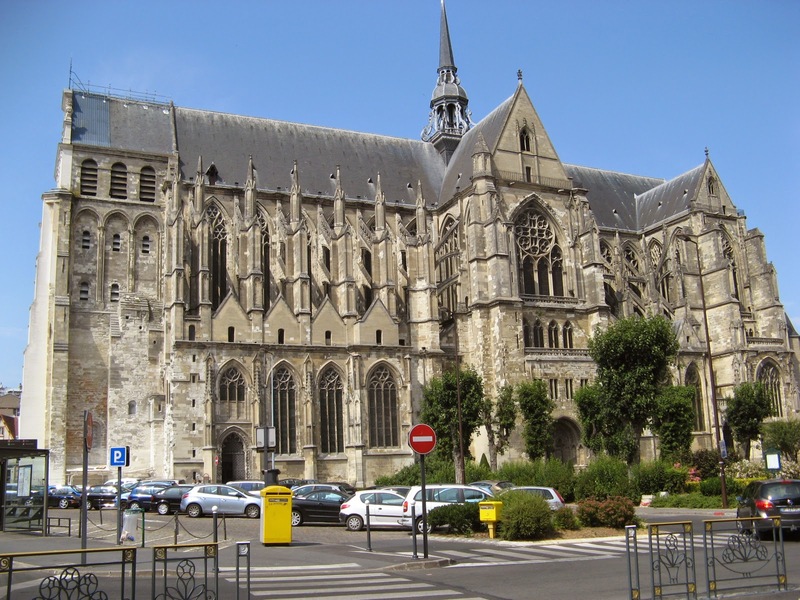 In this post, we illustrate just one such destruction - the Basilica of Saint-Quentin in that region of northern France called Picardy. pictured before the Great War began. of being built and rebuilt over many centuries. 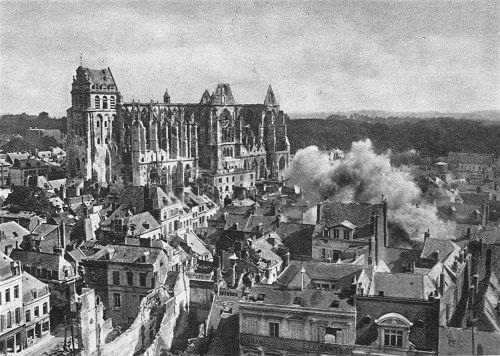 The city of Saint-Quentin was overrun by invading German forces in September 1914 and remained an on-and-off focus of battle to the very end of the war. 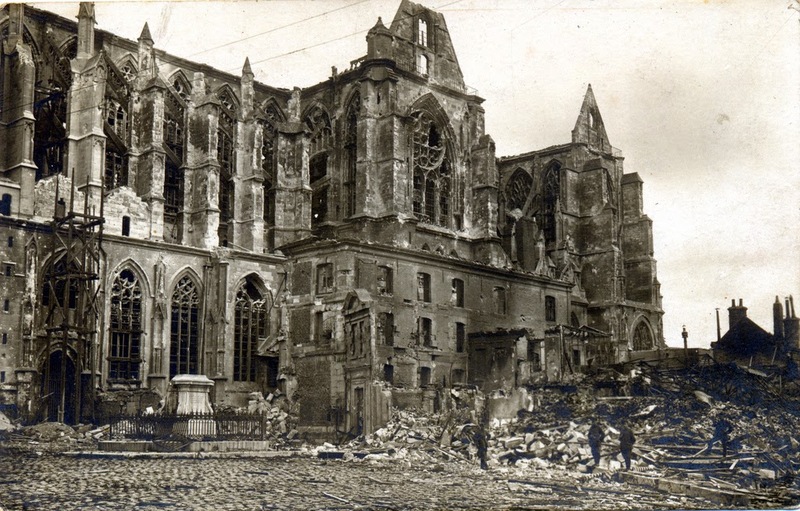 Much destruction on the town and on the basilica was wrought during Operation Michael in March 1918. 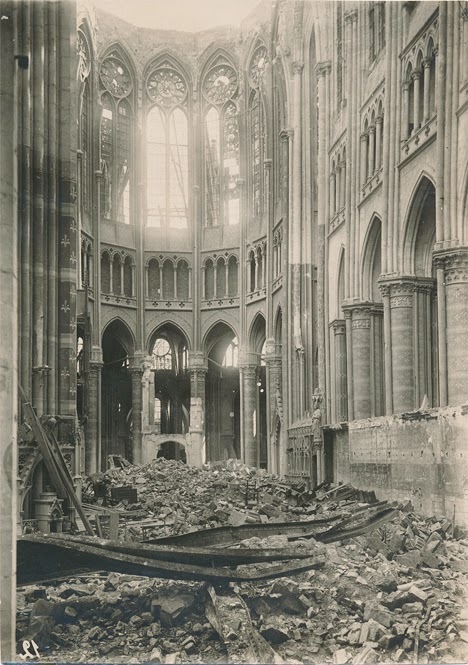 But the basilica had been damaged previously in 1916 and 1917. 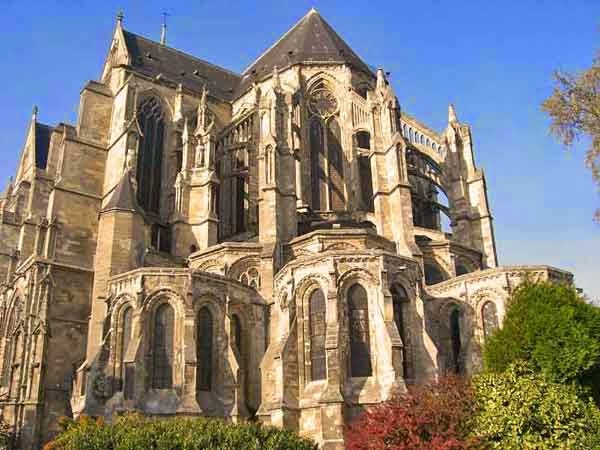 In 1914, the Basilica of Saint Quentin (the city bears the name of the basilica) was eight centuries old. It is believed to have been commenced in the eleventh century, but of this work, the western tower seems only to survive. The eleventh century program replaced earlier churches on the site. From the twelfth to the fourteenth centuries, the basilica was constructed from its east end to the western tower. A more detailed description of its history and architecture can be found here. Ruins of the Saint-Quentin Basilica 1918. 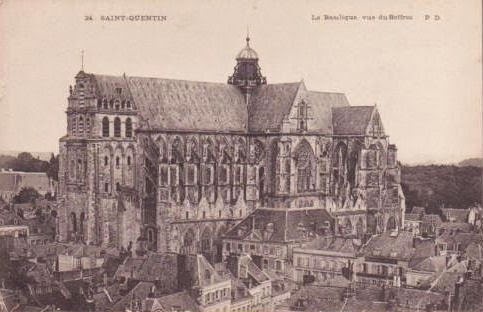 The basilica survived an attempt by the German forces to demolish it completely with high-explosives upon their Retreat in 1918. It has been undergoing reconstruction and restoration in stages over an entire century. The rubble-filled ruins of the choir of the Saint-Quentin Basilica. The rebuilt apse with its chevet chapels. A recent photograph of the southern side of the Basilica. was preserved during the long years of reconstruction after the Great War. 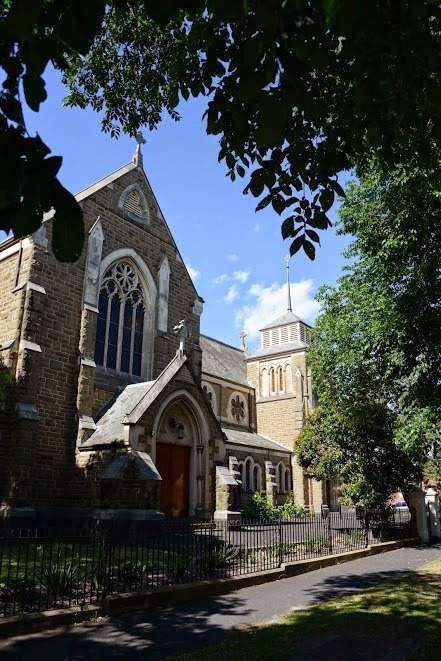 The Church of Saint James in Brighton, formerly known as Gardenvale, and before that Elsternwick is one of many Gothic Revival churches of the Archdiocese of Melbourne (Australia). For Easter Day, we are writing this post about Saint James', because its parishioners cannot fully share the joy of Christ's Resurrection today. 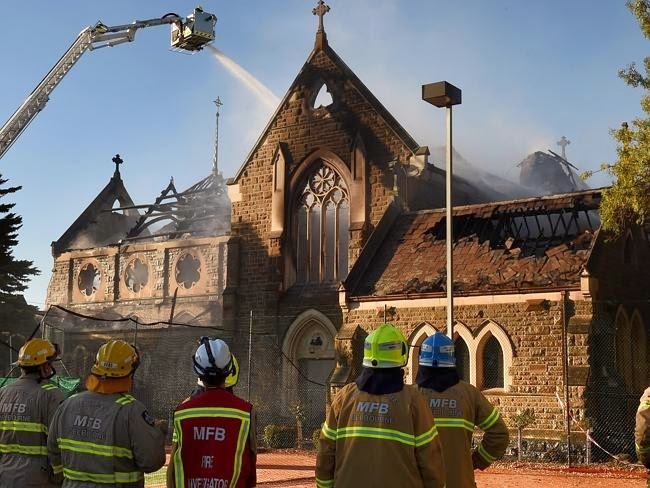 Their church was gutted by fire on Monday of Holy Week, the victim of an arsonist. North transept, nave and belltower. Saint James' church, a brick cruciform building with stone facing, was commenced in 1891, but enlarged in 1924 with the addition of transepts, apse and sacristies complementing the original design of Edgar Henderson. 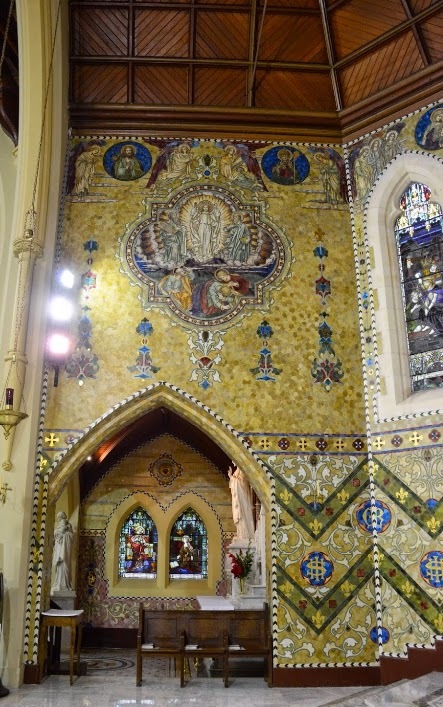 In most respects, Saint James' church was not an exceptional building, but its great glory was the magnificent decorative mosaic work on the walls of the apse and adjacent chapels. This decoration, in a style known as opus sectile, was completed in 1939. Of all this beauty, nothing now remains. The interior of the church was completely destroyed this week past and parts of its brick and stone walls are imperilled. 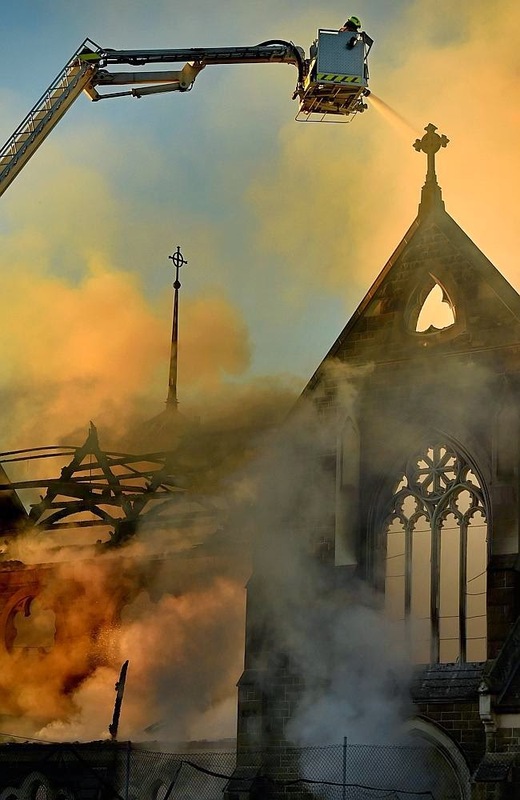 This is the first of a series of posts on Saint James, aimed at keeping this tragedy in people's minds and in the hope that this House of God might - to some extent at least - be rebuilt. 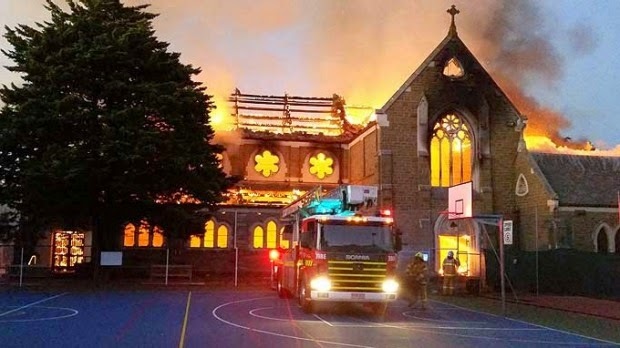 In the meantime, let us pray for its sorrowful parishioners. Send a message of support to the Parish here. Charming interior of Saint James church. of the apse and Sacred Heart Chapel. the view on the south side of the church. the tracery window of the southern transept. Fireman bringing the devastating blaze under control. Charred ruin of the transepts. 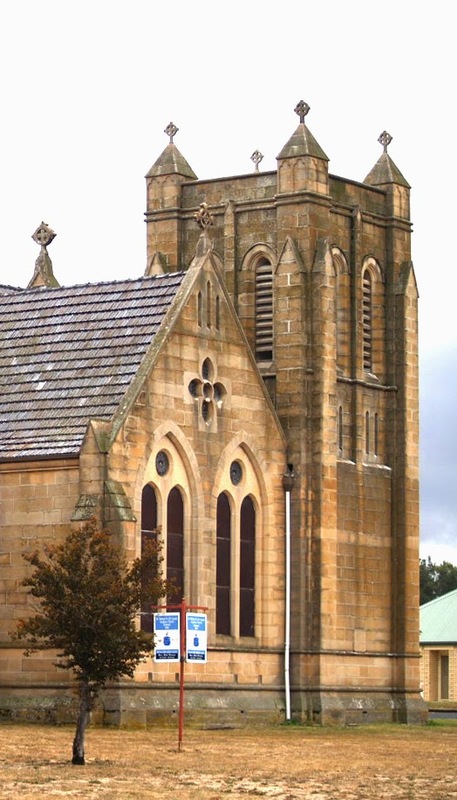 Saint Michael and All Angels, Bothwell Tasmania. It may be argued convincingly that the most identifying feature of a church is its tower. And even though this feature signifies firstly that the building is the House of God, towers remain a potent symbol of community life. There is such a variety in the design of church towers as will afford us many posts on the subject. Church towers originated in ninth century Italy, but obviously the tower as a fortification existed long before they became part of church architecture. Nevertheless, many communities came to appreciate the defensive advantages of having a tower in their midst and indeed the term belfry is of teutonic origin and means a defensive place of shelter. In most places, however, mediaeval church towers were simply intended to accommodate bells, an altogether different meaning of the word belfry. In Italy the term is campanile. The tower under discussion in this post is of the Anglican Church of Saint Michael and All Angels in Bothwell Tasmania (Australia) and looks very much like a defensive place of shelter. 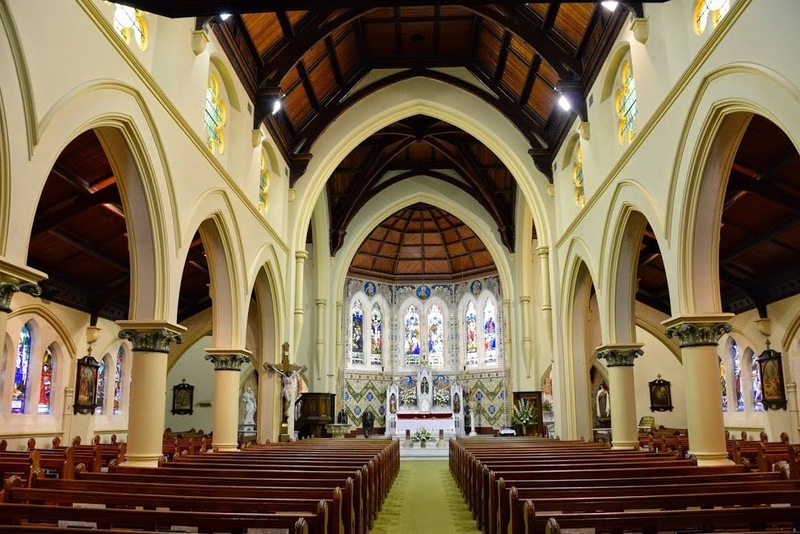 This church was built in stages between 1887 and 1923 to the design of Tasmanian architect Alexander North a Gothic Revivalist of no mean ability. The tower of the church, which abuts the chancel, was the last to be built and is distinctive for its robust design. Although in that muscular vein of the later period of the 19th century Gothic Revival, this squat and robust tower is at least reminiscent of Norman architecture. Four square turrets support this tower and each turret is flanked by two unstepped buttresses, creating clean lines and a keep-like appearance. The pyramid-shaped terminations to these turrets enhance this castle-like feeling (although those four celtic crosses atop are perhaps a little "twee"). No tracery or crenellations break-up the solid parapet of this tower. The eight louvred openings clearly indicate the true purpose of this tower. 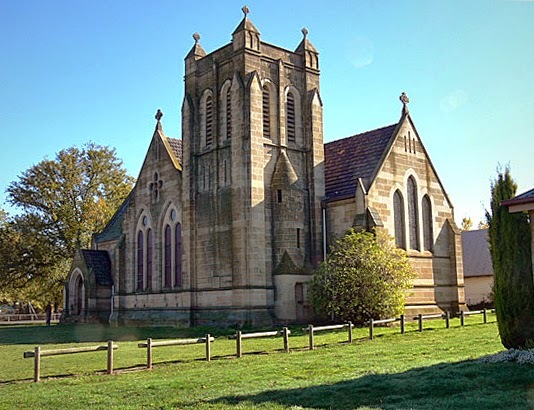 The Church of Saint Michael and All Angels, Bothwell, Tasmania. The tower and porch of this church are the most successful features of its exterior. The church seen from the south east. and also serves as the exterior entrance to the vestry.